Many Indian villages have Brahmanic temples within them, however the religious focus is mainly on the shrines of the village's goddess and god. Rural Indians inhabit a world full of divine and semi-divine beings; tree spirits (yakshas), ghosts (bhootas), puranic, local, personal and ancestral gods who co-exist in a complex hierarchy. As well as public shrines to the gods, every Hindu home has a domestic shrine and a veneration of sacred trees and snakes were both attested to millennia ago and still play a important part in religious practice and belief today. Unlike in orthodox puranic Hinduism villagers have direct access to the local gods and do not require the intercession of a priest. The Goddess also plays a larger role in local religion and rural religion is centred on specific places of perceived spiritual power. The shrines themselves are relatively simple affairs. They are usually covered and often enclosed on three sides by a low wall. Shrines with buildings on them are quite rare. The simplest form of shrine can consist of a pile of stones by a riverbank or in a field, where, at some point in the past a spirit had made its presence known. Villages often have a number of shrines to different deities located at the edge of the village. A general view of the Shrine. In South India the most visually striking shrines are those dedicated to the god Aiyanar. 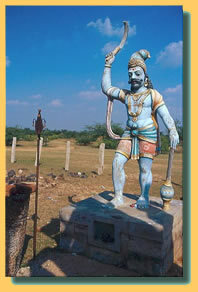 Aiyanar is a Brahmanised pre-Aryan deity and is regarded as a benign being concerned with the welfare of the village community rather than that of the individual. 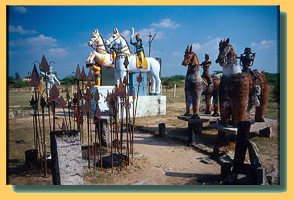 Shrines to Aiyanar are used on special occasions and can therefore sometimes look neglected. Aiyanars power is dependent on three subordinate gods named Karrupu, Muniyan and Maturaiviran who are regarded as impure spirits. Aiyanars shrines sometimes contain huge brightly painted terracotta statues of these subordinate gods. Throughout India, a part of ritual practice involves making offerings of food, flowers, incense or terracotta figures, mainly of animals, to the deities. 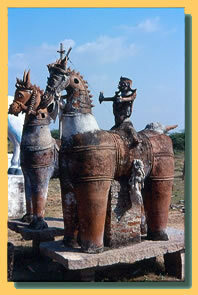 Life size terracotta horses are offered to Aiyanar and are believed to serve the god in the spirit world and carry him around the village at night as he protects it. The horses are renewed from time to time but the old ones are kept so the shrines often contain a small herd. Devotional terracottas are made by professional potters of the Kumhars caste and have a long history going back to the Harrapan culture of 2,500 BCE. The skill of a potter is believed to be a gift of the Gods and the potters are understood to possess a kind of magical power. Another widely worshipped God in South India is Murukan (the Tamil name of Kartikeya). Murukan is invoked for protection and is a god of war associated with the planet Mars. In village shrines, Murukan is represented by a spear. In areas where he is regarded as the offspring of Shiva and Parvati, a trisul (or trident, an emblem of Shiva) can be found next to the spear. Offerings of ghee or fruit are skewered on to the blade tips although human hair is considered to be the most auspicious offering to Murukan. In addition to the type of offerings made to the male gods the village goddesses can require placating with live offerings. Where Goddess shrines contain anthropomorphic images of the deity, they are usually roughly carved in stone or wood, garlanded with flowers and sometimes dressed in clothing. An unpaid priest and his assistants have the duty to maintain the shrines (at the community's expense) and to propitiate the deity to ward off communal bad luck and disease. Individual villagers, regardless of caste, can approach the village deity directly as and when they have a need. At specific times of year and during crisis a festival is held in honour of the Goddess. The main feature of these festivals is the sacrifice of an animal, at one time buffalo sacrifice was widely practised, nowadays the victim is more likely to be a goat or chicken. In Northern India the blood from such sacrifices is shunned because it is regarded as impure. In the South the opposite is true, the blood is liberally flecked and smeared over the altar and devotees, as there is a strong belief in the power of the impure. The meaning of the sacrifice appears to be to release the power of the Goddess into the community. As the Goddess is regarded as both destructive and creative it is not considered wise to allow her presence in the village for very long. Spirit possession is also a feature of the Goddess festival as are severe penances such as hook hanging, fire walking and fire swallowing. Brahmins discourage the practice of animal sacrifice and not all villages Goddesses demand it. Examples of ‘vegetarian' Goddesses in Tamil Nadu, include Antal and Sapta Kannimar, while in Orissa Ma Ksetrapala prefers cannabis. Widely known Goddesses such as Mariyamman in Tamil Nadu and Sitala in North India are relived differently from one area or village to the next and offering vary according to their perceived character. 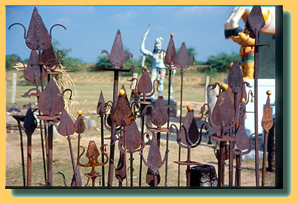 In parts of South India Goddess shrines are located to the north of the village. This is significant as the north is associated with spiritual knowledge and disease and so emphasises the innate duality of the Goddess. Western scholars have tended to portray village Goddesses as sinister or malicious and venerate or placated through fear, however they are best described as ambivalent and are the objects of intense devotion. Snake veneration is also an important part of Indian religion. An important festival called the Nagapanchami is held at the start of the rainy season in August and it is a common sight to see Naga worship all over India by those hoping to be blessed with children. The Nagas are a race of serpents whose origins are described in the Mahabharata and the Varaka Purana. As divine beings they are depicted in human, half human and fully serpent form. In rural areas snakes are commonly found near ant hills and termite mounds, both of which are regarded as the entrances to the otherworld. The mounds are frequently marked with ash and offerings of milk or eggs are made to the resident Naga. Particularly impressive mounds can thatched roofs supported by posts placed over the, similar to some Goddess shrines. Like the dragons of European mythology Nagas are seen as guardians of the otherworld and of treasure. There is also an association between snakes and trees, both being symbols of fertility and the roots of trees, like the termite mound, is seen as an entrance to the otherworld. In South India women desiring children erect snake stones under sacred tress. These stones have stylised cobras carved on them represent the Goddess Nakamal (snake virgin) and are immersed in water for several months to empower them then erected under Nim, or Pipal trees, accompanied by prayer and ritual. In North India Manasa is invoked for protection against snakebite and to cure infertility and is represented by an earthen snake image, the branch of a tree or a water pot. As mentioned above, trees are considered to be symbols of fertility however overlying this aspect of folk religion is the Vedic concept of the tree as the axis of the Cosmos. The Rg Veda relates how sacrificial offerings were tied to a tree so that the energies released would travel upwards to the realm of Gods. Sacred trees can be found in villages, within a temple complex or shrine and in forests. The tree spirits or Yaksha (male) Yakshini (female) was worshipped in very early times, however much of the reverence shown to them has been transferred to the river Goddesses. The Yaksha is still recognised but villagers can make offerings to their ancestors, local Gods and puranic deities through the tree. The Pipal tree, for example, is believed to be the home of the elder sister of Laksmi, a Goddess named Nairrti, who seems to be a Brahmanised village Goddess. Nairrti could be described as Laksmi's dark side, as she represents misfortune. The Pipal is not touched except on Saturday when Nairrti is believed to visit Laksmi. 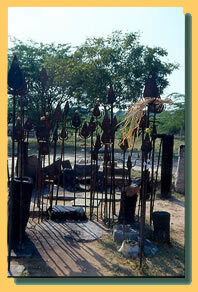 Shrines to Nairrti are found outside villages. The Gond tribe venerates pairs of trees simply as “man” and “woman”. The shade of a tree is also considered sacred. The ancient art of mediumship under sacred trees, especially those in the grounds of temples and shrines is still a common occurrence. In forests trees can be found stained and garlanded with beads, representing Bana Durga (Forest Durga) and shrines to forest Kali can be found under pairs of trees. The trees are given a similar reverence and type of offerings as those given to the Gods. Sacred spaces are created in the home, often an entire room is used as a place of worship. Offerings of food and incense are made to the Gods, who are represented by the statues made from brass, wood or stone. The help of the deity is sought mainly but not exclusively by the women of the house for a range of personal and domestic issues. The custom of making a sacred vow or Vrat to the deity forms the basis for many domestic rituals. The custom of Vrat originates in part from the Artharvaveda, the last of the four great Vedas which contains spells and incantations derived from folk religion. The knowledge of Vrat rituals is said to have been spread throughout India by magician priests who were accompanied by a sacred prostitute and a musician as they toured villages in brightly painted carts. The success of the ritual relies upon an implicit belief in magic and the focusing of intent, empowered by gesture and incantation to raise energy. The nature of the rituals varies according to the individual, although they do usually involve recitation of mantras and the making of magical drawings. The ritual may also need repeating on a monthly or seasonal basis. Finally a vow is made to the deity to perform an austerity, usually fasting for a fixed period, for example every Monday for sixteen weeks, or to provide gifts when the outcome is known.